GoodBed's simple explanation of the full range of Sealy and Posturepedic mattresses, including the Response Essentials, Response Performance, Response Premium, Conform Essentials, Conform Performance, Conform Premium, and Hybrid collections. 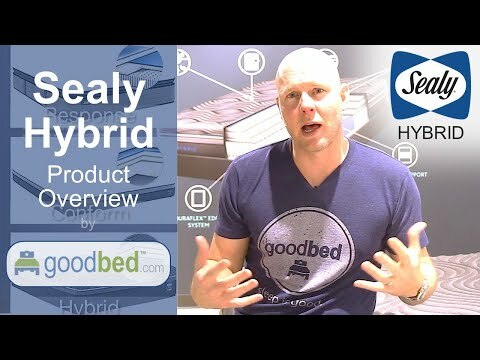 GoodBed's simple explanation of the full range of Sealy Hybrid mattresses, updated in 2018. Sealy produces a broad range of innerspring and specialty mattresses and foundations, operating 25 plants in North America, and selling its products in thousands of retail stores. Sealy manufactures bedding in 20 states, three Canadian provinces, Mexico, Puerto Rico, Brazil, Argentina, France, and Italy. Sealy operates a research and development center in High Point, North Carolina, with a staff that tests new materials and machinery, trains personnel, compares the quality of Sealy's products with those of its competitors and develops new products and processes. Sealy, as distinguished from most of its competitors, also manufactures many of the important component parts that are used inside the mattress. Sealy owns and operates a component-manufacturing subsidiary, with three plants that produce virtually all of the company's proprietary and patented mattress innerspring requirements and approximately half of its foundation components. Sealy manufactures most bedding to order and has adopted "just in time" production techniques in its manufacturing process to more efficiently serve its dealers' and customers' needs. Most bedding orders are scheduled, produced and shipped to retail warehouses within 72 hours of receipt. This rapid delivery capability allows Sealy to better satisfy customer demand for prompt shipments. Sealy sells its products through thousands of retail outlets, which include furniture stores, national mass merchandisers, specialty sleep shops, department stores and warehouse clubs. Based on 92,551 real owner experiences with this brand. How do people like you rate their Sealy mattress? Mattresses are personal. Filter the 92,551 Sealy ratings by sleep position, weight, age, gender and more to find the ones that are most relevant for you. The Sealy Posturepedic line has 32,732 ratings and 228 reviews on GoodBed. The Sealy Baby line has 53 ratings and 0 reviews on GoodBed. The Sealy Response line has 45 ratings and 0 reviews on GoodBed. The Sealy Conform line has 59 ratings and 3 reviews on GoodBed. 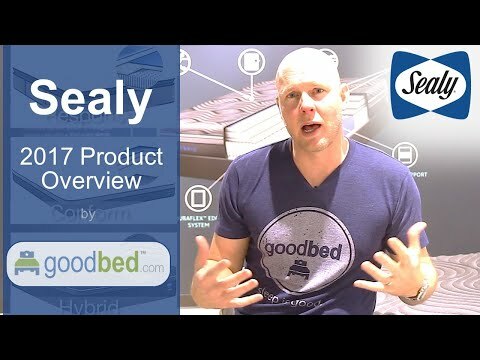 The Sealy Hybrid line has 79 ratings and 0 reviews on GoodBed. The Sealy Posturepedic Crown Jewel Advance collection has 29 ratings and 0 reviews on GoodBed. The Sealy Response Performance collection has 21 ratings and 0 reviews on GoodBed. The Sealy Conform Premium collection has 9 ratings and 0 reviews on GoodBed. The Sealy Conform Performance collection has 28 ratings and 3 reviews on GoodBed. The Sealy Response Premium collection has 16 ratings and 0 reviews on GoodBed. The Sealy Response Essentials collection has 7 ratings and 0 reviews on GoodBed. The Sealy Conform Essentials collection has 11 ratings and 0 reviews on GoodBed. Sealy mattresses are recommended by 73% of owners on GoodBed (based on 92,551 ratings + 327 reviews). Want more reviews from Sealy mattress owners? Do you have something to say about your Sealy mattress? Write a Review! Whatever you do in bed, Sealy supports it. Sealy is a large mattress manufacturer founded in 1881 that is based in Trinity, NC in the United States. Sealy also owns Stearns & Foster and Bassett. Sealy mattresses are available at Sears, Macy's, Ashley Furniture, Ethan Allen, along with many other mattress retailers. Additional product details can be found by viewing discontinued mattress models from Sealy. Have an update or correction to our information about Sealy? If so, please take a moment to suggest an edit. Sealy mattresses sold by Amazon come with a 30-night in-home trial. Mattresses still in their original packaging can be scheduled for UPS pickup. Otherwise, contact Amazon Large Item Pickups at 866-423-5353 to arrange return. Return shipping fee (typically ~$59) will be deducted from your refund. Showing stores with Sealy products nearest to Fairfield, CT. Call store first to confirm availability.